Our Brown & Blue checked Argyle Harness is a traditional Scottish design which represents the Clan Campbell of Argyll in western Scotland. It is stylish, classy and never goes out of fashion. Used for kilts and plaids, and for the patterned socks worn by Scottish Highlanders since at least the 17th century. It is lightweight and incredibly strong. 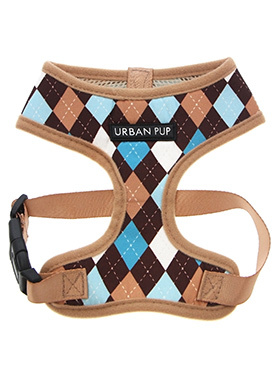 Designed by Urban Pup to provide the ultimate in comfort and safety. It features a breathable material for maximum air circulation that helps prevent your dog overheating and is held in place by a secure clip in action. The soft padded breathable side covers the dogs chest and the lead clips onto the D-Ring between the shoulder blades. A matching lead is available to complete the outfit.